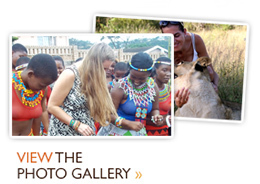 Take in the sounds and sights of Southern Africa with a twist to pique your interests. Combine your passions and your intrigue with an exotic holiday in the African bush. Share it with friends and family or join a group of like minded fellow explorers, either way you will be blown away by your experiences. From fine dining of Michelin acclaim to home-grown township cooking, from organic farmers markets, and cheese factories to historic and world renowned wine farms nestled in the heart of magnificent mountain ranges and Braai’ing (BBQing) in the bush on Safari, participation in this programme literally is soul-food. You will participate in a broad variety of culinary experiences both hands on and experiential. Guided by experts who intimately know the history of the battlefield regions of South Africa, participants on this tour will be taken behind the scenes, meeting descendants of the historical conflicts experienced in South Africa. Whether it be the Second Anglo-Boer war with its strong Australian involvement or the Zulu Wars and the battle of Islandlwana, this programme will enthrall young and old and take the participant to sites of majestic beauty. South Africa is a land of contrasts and is home to a melting pot of varied cultures that have all significantly shaped the nation’s identity. Malay’s were migrated during the slave trades, Indians have long ago settled here, more than 9 African tribes call this country home. European settlement happened in 1652 and with the clashes between the Dutch and the English, not even the white culture of South Africa is homogenous. Exploring South Africa from a cultural perspective leaves the visitor with a very grounded and rich understanding of the country and how it has developed into the multicultural rainbow nation of today. South Africa is a playground of adventurous activities waiting to be explored. Why delay your planning till you are in-country, when you can plan ahead, building anticipation of all the fun to come. From the weird and wonderful like ostrich-riding and great white shark or crocodile cage diving to abseiling the face of one of the world’s seven natural wonders (Table Mountain!) or even Bunge’ing the world’s highest drop. You can participate in multi-day hikes through pristine mountains and valley scapes, or bush-walk in the wild with animals unsuspecting around the bends in the path. Water-lovers surf the famous J-Bay break, kayak in the magnificent Garden Route, wake-board, kite-surf, water-ski…. The only questions are: Where do you start, and how do you finish? Africa is a magical place, enthralling and mystical, especially for the young… which in turn makes it wondrous for the young at heart accompanying them! This could be the most rewarding, bonding family holiday ever. Other than spotting the wise elephants, kings of the jungle and all their kingdom in the wild, participate as families in learning the traditional zulu art of beading, caring for orphaned penguins at a sanctuary, riding elephants or ostriches (! ), going on an archeological dig at the cradle of humankind, walking with cheetahs in their natural environment, mountainbiking, bungi jumping, shark cage diving and so much more. Get back to nature and participate in authentic twitter experiences on an ornithological extravaganza. Most likely in places where the modern day Twitter will not find reception, you will enthrall yourselves by witnessing the splendours of our feathered friends whilst enjoying time spent in the african bushlands, surrounded by none other than the Big 5 just to make your birding experiences that much more exciting. South Africa is host to 3 significant annual world sporting events and whilst each is the king-pin of your itinerary, your visit to South Africa is rich and full of extraordinary experiences as you journey through this land of intrigue. For many, participation in one of these events will be a bucket list item proud to be achieved and our itineraries accommodate your loved ones as they journey with you in support of conquering dreams. Cyclist converge on Cape Town in March for participation in the largest individually timed cycle tour in the world. For cyclists of all abilities, the opportunity to navigate the renowned Cape Peninsula on two wheels on closed roads with thousands of others, is a wonderful opportunity. The Cape Argus Cycle Tour Fever hits town in full force and the festivities are fabulous. Named from is location at Midmar Dam in Kwazulu Natal, The Midmar Mile is an annual swimming race of roughly one mile because while the distance covered is always a mile, rainfall and water level variations result in the distance swum varying each year. It attracts serious competitors, Olympic medalists and recreational swimmers alike and is recognised by The Guinness Book of World Records as the largest open water swimming event in the world. The Comrades is an ultra marathon of approximately 89 km (56 miles) which is run annually between Durban and Pietermaritzburg. It is the world’s largest and oldest ultra marathon race and alternates each year between the “up” run from Durban and the “down” run from Pietermaritzburg. Started in 1921, the race was the idea of a World War I veteran to commemorate the South African soldiers killed during the war. As a memorial, the Comrades is a unique test of the physical endurance of the entrants and one of its primary aims is to “celebrate mankind’s spirit over adversity”. Combine the pleasure of holidaying with your passion for photography in a land that cries out to be photographed. Rich rewarding African sunsets, animals in silhouette, offshore sprays of ocean waves crashing on pristine beaches, wild African animals in their natural environments, hawks in flight. Diverse traditional cultures displayed in dress and architecture, vineyards, valleys, mountains, rivers and ravines. So much to experience, witness and capture. Our photographic safaris are spent in the company of like minded travellers, and accompanied by some of South Africa’s well renowned photographers who will be on hand to share their knowledge and experiences ensuring that you leave your holiday enriched with experience and skill. South Africa is a land of unsurpassed natural beauty and quiet, cambered, roads full of twists and turns and surprisingly quaint towns around the bend makes for a motorbike exploration of heady proportions. There are routes confined to small areas or you can journey across the country – its only a matter of time to spend. Riding on new and well maintained bikes with plenty of pannier storage you are free to journey as you will but the recommended routes will not dissappoint as they take you through the winelands, the coastlands and inland mountain passes.